Quite helpful to the RVer, RV dump stations receive dirty and used waste water from your holding tank or other device that acts in a similar manner. The stations dump the contents according to laws and regulations into approved disposal systems. Dump stations may be free or charge a small fee and you can find locations in the 50 states, Canada and around the globe. Camping World in Dothan, Alabama has a free dump with the water and dump hose already hooked up for your convenience. Shady Acres Campground in Mobile, Alabama is another free dump site whether you stay here or not. In Georgia, the John Bleakley RV Center in Douglasville is free. The dump station here is open from 8am-6pm Monday thru Friday and between 8am- 5pm on Saturday. The Welcome Center in Columbus, Georgia, located at exit 12 of I-185 is also free. If you find yourself in Arnold, Nebraska, City Waste water plant on the south side of town near state highway 47 offers free RV dump stations. The city of Cambridge, Nebraska, also has a free station at a rest area off of US 6/34 on the east side of town. Ohio has some of its own free dump stations, including the one in Celina at the Mercer County Fairgrounds. Here, the dump station is at the northwest part of the fairgrounds, close to the horse barns. 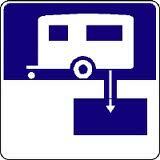 If you stop at the Craig Smith RV Center in Galion, Ohio, you may dump your waste at no charge. The city park of Buffalo, South Dakota on the west side of US 85 has free dumping, rinsing, and fresh water. You might also enjoy using the park's restrooms and picnic shelter, as well as their free overnight camping sites. If you make it to Burke, South Dakota, a public dump station behind the Pump & Stuff convenience store on US 18 can lighten your load for free. Flying J is a chain of gas stations that provide showers, a game room, lounges and sit down meals from partners like Denny's. The Flying J is well known in the truck and RV communities for these and other conveniences, such as dumping. Until recently, the dump station at these facilities was free but the company decided to impose a $5 or $10 charge, depending on whether or not you have a membership card. While many RVers are not happy about this change, the convenience might still outweigh the fee as the Flying J has locations in Canada and most of the 50 states. Sometimes when you sit for an extended time, perhaps boondocking for the winter, you don't want to pack everything up in order to drive to a dump station. If you are lucky the dump station will come to you in the form of the honey wagon. One of the nice things about this is that the driver does all the hooking up, so you don't have to mess with the hose or the smell. Of course, depending on your location you can pay upwards of $25, if not more. RV dump stations exist along many of the main highways that cross the United States of America. Off of the Alabama Interstates 10, 20, 59, 65 and 85 you can find a number of places to empty your waste. Near various parts of Interstates 5, 8, 10, 15, 80, 210, and 880 in California, dump stations await your arrival. You may find it easy to get to dump stations from Michigan Interstates 69, 74, 94, and 96 or when traveling along Nevada Interstates 15, 80, US 95 and NV 373. When you want to make your way out East, Pennsylvania Interstates 70, 76, 78, 80, 81, 90, 276 offer many public dump stations for you to use. 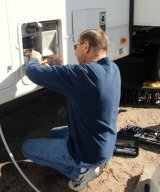 RV dump stations exist for your convenience so it is important to keep them clean and not abuse their services. When these problems occur, it causes businesses to charge fees or stop operating as a dump site, which ruins it for everyone. Next time you have to lighten your load and dispose of your waste, be considerate as only a few free sites remain.